Skin 2 Skin®, Plant Powered™, Revitalizing Eye Gel is a pure high performance duel action eye treatment product with Bio-Identical High Performance Peptide, Plant Actives, s2s Aloe Vera Leaf Juice and s2s 20 Complex™ without any fillers, emollients, skin conditioners and fragrance. 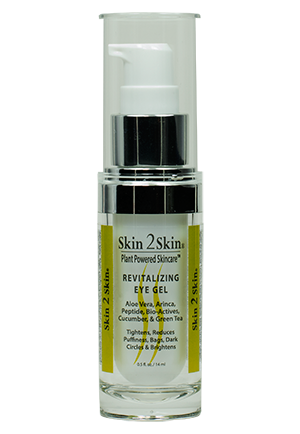 Skin 2 Skin® Revitalizing Eye Gel has an immediate elevating eye lifting power that last up to 6 hours with long term wrinkle and fine line reduction, improving hydration and moisture retention, firms, tightens, lifts, with Arnica Extract that soothes, renews the skin and quickly reducing dally puffiness. Two New Powerful Plant Actives Aldvine 5X and Lanahrys together quickly decreases dark circles, brightens eye contour, reduces eye puffiness and under eye bags and giving you radiant youthful eyes. Osilift – Oat Kernel Extract has an immediate elevating lifting power & wrinkle reduction with significant effect 6 hours later, long term anti-wrinkle action. Arnica Montana Flower Extract – Plant Active sooths and renews the skin, reduces eye puffiness quickly on contact and healing. Chronoline, Bio-Identical High Performance Peptide – reduces fine lines and wrinkles in 28 days, supports collagen, rejuvenating the eye area, smoother, and firmer eyes. Aldvine 5X – Plant Power Active born from 2 calibrated unique algae, Red Algae and Brown Algae form pollutant-free UNESCO environment protected area in the North Atlantic. Decreases the intensity of dark circles, brightens eye contour, and combined with Lanachrys reduces eye puffiness and eye radiance. Lanachrys – Plant Active Extract from the golden petals of the small plant Chryanthells in Africa. Clinicals show a fast reduction of the appearance of under eye bags and eye puffiness. Skin 2 Skin® uses this ingredient instead of caffeine that can cause irritation to the eye area and sensitive skin with better results. Apply Revitalizing Eye Gel - Use half (1/2) a pump for eyes twice daily, morning and night. Apply under the eye but avoiding getting into the eye, Crow's-Feet and follow the Orbit bone up to the top of the eye. Avoide getting product on the eye lid or in the eyes. To get the best and maximum results possible it is very important to maintain a daily skin care regimen. Only with regular and continued use will you prevent the reappearance of aging skin including fine lines and wrinkles. My dark circle look so much better. I have more moisture around my eyes also. I feel I look so much better.